The black RIG-FS7XL Large Rig Camera Case with Interior Kit from Porta Brace is designed to carry your Sony PXW-FS7 camera. 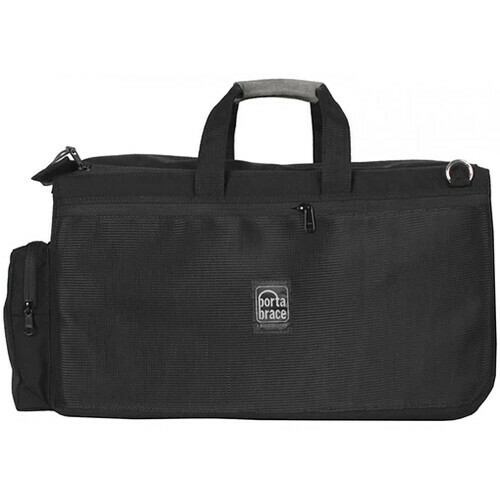 This large and flexible case is durable and complete with accessory items that will assure that your gear is held safely and comfortably in place. The case is made from rugged 1000-denier Cordura nylon for durability. The bottom is bolstered by a layer of waterproof rubber to assist with ground protection. It can be carried by its two top suede leather carry handles or removable suede shoulder strap. The main compartment is accessed via strong zippers and a touch-fastened front flap. The compartment is empty and can be configured to meet your needs using Porta Brace's included hanging pocket, camera tie-down cinch, and camcorder cradle. The case also comes with two padded lens cups, a stuff sack, a carabiner with an attached flashlight, and a handy white balance card. Two large accessory side pockets are accompanied by a front slip pocket for various quick-need items. The RIG-FS7XL comes with a convenient rear trolley sleeve that allows you to load this case on top of your optional luggage cart. Box Dimensions (LxWxH) 32.5 x 16.0 x 13.5"
RIG-FS7XL Large Rig Camera Case with Interior Kit for PXW-FS7 is rated 5.0 out of 5 by 1. Rated 5 out of 5 by RickG from Much better fit I ordered this case for my FS7 so that I could drop it in and out without having to remove view finder. Still need to remove the handgrip, But find I'm shooting most things without that on anyway. And this case allows it all to be stored/packed nicely. Both this case and the first RIG-FS7 are extremely well constructed, carry well and should last for many years.